Today, a federal judge ruled that a portion of a contentious Texas abortion law will not go into effect as scheduled tomorrow. U.S. District Judge Lee Yeakel wrote that part of the state's new abortion law is unconstitutional and would unreasonably restrict a woman's access to abortion clinics. The new law was thrust into the national spotlight in June, when Rep. Wendy Davis launched an 11-hour filibuster in an attempt to block the bill in the Texas legislature. The bill, however, was passed and signed into law by Texas Gov. Rick Perry in July. The law mandates, among other things, that doctors have admitting privileges at a hospital within 30 miles of the abortion clinic; it also requires more oversight for women taking abortion-inducing drugs. Additionally, the law includes a ban on abortion at 20 weeks post-fertilization, although this provision was not challenged in this case. In short, it is one of the most restrictive abortion laws in the nation. Planned Parenthood, abortion doctors, and other pro-choice advocacy groups sued to block portions of the new law, arguing that the restrictions would force the closure of a third of the clinics in Texas. They claimed that abortion doctors had applied for admitting privileges at nearby hospitals, but many of those hospitals were either religiously affiliated or did not want to risk reprisals for providing those privileges. Judge Yeakel wrote yesterday that the admitting-privileges provision "is without a rational basis and places a substantial obstacle in the path of a woman seeking an abortion of a nonviable fetus." The new law also bans off-label use of abortion drugs, but the plaintiffs argued that FDA protocols for abortion pills are no longer the best practice used by most doctors. Judge Yeakel, however, partly upheld this portion of the law, "except when a physician finds such an abortion necessary, in appropriate medical judgment, for the preservation of the life or health of the mother." 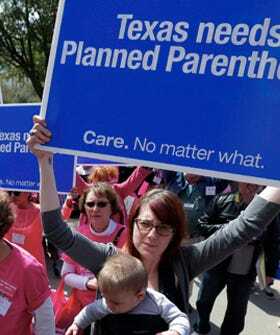 The Texas attorney general's office, however, maintained that the law protects both women and their fetuses. Attorney General Greg Abbott announced yesterday that his office will file an emergency appeal to the 5th Circuit Court of Appeals in New Orleans. Correction: A previous version of this article stated that the entire law had been blocked, but only one part of the law was enjoined from being enforced. We have updated the article to clarify that and Judge Yeakel's ruling.